Cork Institute of Technology’s research programme includes support for investigative analysis of particular relevance to Irish, European and Global Industry. 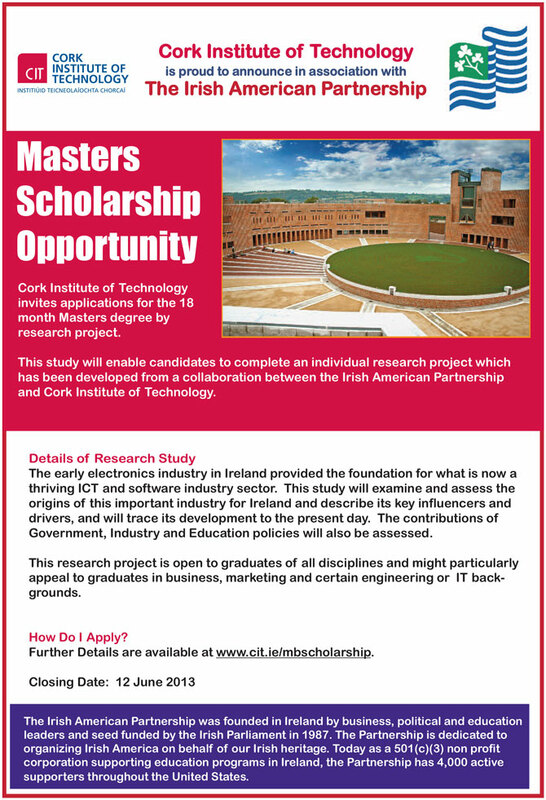 Applications are invited from suitably qualified candidates to undertake research into the early Electronics industry in Ireland which provided the foundation for what is now a thriving ICT and software industry sector. This study will examine and assess the origins of this important industry for Ireland and describe its key influencers and drivers, and will trace its development to the present day. The contributions of Government, Industry and Education policies will also be assessed. Applicants for this Masters Programme should have an honours degree (minimum 2H1) in any of the following areas: Business, Marketing, Engineering and IT. They should be individuals who possess good analytical, writing and communication skills, and be highly motivated. Successful applicants will be registered for a Master of Business through research and will be paid a grant to cover fees and maintenance for two academic years. An account of the development of the electronics sector in Ireland over the past 50 years. An assessment of the linkages/relationships which operated in the industry sector throughout this period. Recommendations highlighting lessons learned from this case study with respect to policy development and support structures.